Jasper Head Tennis Coach, Christian Matthews was recently named the 2017-2018 Alabama Boys Tennis Coach of the Year by the NFHS (National Federation of State High School Associations). Coach Matthews was nominated for this prestigious award by the Alabama High School Athletic Association, which honors the top Coaches in each sport annually. Coach Matthews receives the NFHS State Coach of the Year Award after leading the Men’s Tennis Team at Jasper High School to the 2017-2018 State Tennis Championship. 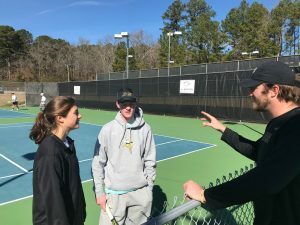 Matthews, entering his 5th year as the Head Men’s and Women’s Tennis Coach in Jasper is an alumnus of what was then Walker High School, where he was part of a team that won 4 State Championships.